Based in Huntington Beach, California, Mandrake's Love Apple is led by sitar player Jerry "Mandrake" Zepeda who studied with Rahul Sakyaputra. "Elephant Memory" is a heavy rocking psych tune with Zepeda's sitar functioning in a lead guitar role. It's an interesting combination hearing the heavy driving power rock rhythm section and the sitar, an instrument that can't help sounding trippy. "13 Tears Of The Purple Cobra" is a nice drifting duo of Zepeda on sitar and Vine Sweetland on tabla producing precisely the hypnotic sounds you would imagine from the joining of those two instruments. There's not much to summarize as there's only two songs here but I'll say that I'd love to hear more from Zepeda, especially psych rockers like "Elephant Memory". 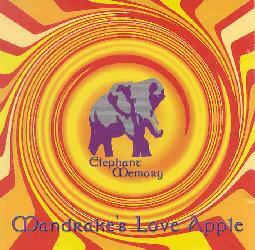 For more information you can visit the Mandrake's Love Apple Mp3.com web site at: http://www.mp3.com/MandrakesLoveApple. Visit the Zemira Productions web site at: http://www.zemira.com. Contact via snail mail c/o Zemira Productions; PO Box 41162; Long Beach, CA 90853.